This "Living, Succulent Tapestry Pillow" was designed by Shirley Bovshow and created in less than five minutes! * The video from the Home & Family show is on automatically, if you would like to turn it off, please scroll down and press the "play" button. (Hopefully, you'll want to watch it). One of my favorite "garden craft" designs is the "Living Tapestry Succulent Pillow" that I originated a few years ago for my live presentation at Epcot in Walt Disney World. Ever since then, I've been tweaking it out and I really like how it looks these days. I had the opportunity to present the succulent pillow on the "Home & Family" show which airs weekdays on the Hallmark channel. Watch my garden segment on Home & Family show. The one I created for Home and Family is a bit more fancy, but the succulent pillow instructions are the same. I'm making a living succulent tapestry pillow for my presentation at the Epcot International Flower and Garden Festival! It's part of my "10-Ways to Incorporate Art in Your Garden," presentation and is an affordable and easy garden craft to make. Here's a video I recorded a couple of years ago for the succulent pillow. Watch us make the succulent pillow on my web series, "Way to Grow" on the Digs channel on YouTube. It is a Shirley original, as far as I know, (a vision came to me for it while watching Citizen Kane). Inspiration comes from the most unlikely places! This pillow is so easy to make that you will feel guilty accepting compliments for it. Outdoor pillow in solid color- avoid prints if you want your plants to be the focal point. Open the seam of pillow on one side and remove all the stuffing. Remove the succulent from the pot, remove half of the soil and wrap pantyhose around root ball to keep intact. 4. Cut slits where you want to place your succulents and gently insert the plants. Open an area in the moss and insert succulent root so that it's not free-floating in a sea of moss. You may want to add a "fringe" effect to the pillow by using a trailing plant such as fishtail senecio. If you like a true pillow look, you can add Velcro to close the pillow. Or, leave it open and crown the pillow with a focal point plant like a small aeonium or echeveria. You are done and ready to receive your praise! 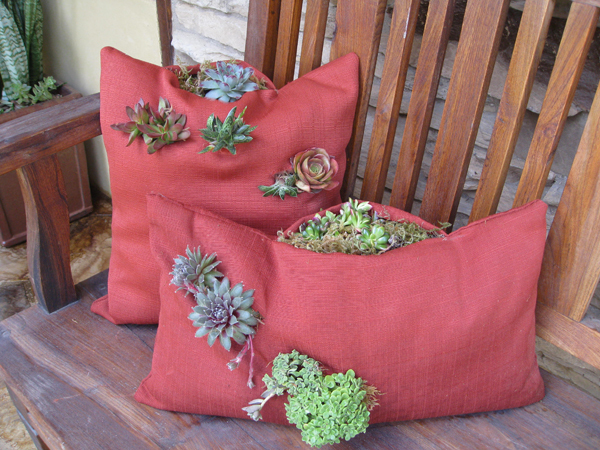 Place your living succulent tapestry pillow on an outdoor bench or other water-safe surface in a part shade area. Don't subject your pillows to harsh sunlight. Water by misting roots once a week and less frequently in the winter time. If you leave an opening on top of pillow, you can add water there and it will flow down to water your succulents. Cold winter gardeners can over-winter their succulent pillows indoors and place on a pebble tray. Succulent pillows can last for a few years although you may want to plant the cuttings in the garden once they get bigger. If you like my succulent pillow, pin it on Pinterest and tell your friends about it. I love love your ideas I work for a pizza oven fireplace manufacturing company here in Salinas Ca and we would love to have you do something with our ovens on your show I think we would really compliment your style. Have a great week and keep up the awesomeness! I missed the show—darn it. I had a good excuse. I was moving. I won’t miss April 13th!! I missed this post too cause I was too tired to think. This is a cool idea with the pillow. I bet everyone loved it. So what were everyone’s responses? What else did you do out of the box? Gosh, we can’t wait to hear???? Did you have a big crowd. Shirley, the southeast is going through some big changes right now with cable. Our town has been chosen for a new cable system and if it works the way they think it will they are going to branch out from us and web their way in all directions. New cable lines are being buried day and night as we speak. Our cable provider has made it almost impossible to get your show and within the next 6 to 8 months, it’s going to be a whole different ball game. I’m predicting that your type and quality of show is needed around here. Most people in our town don’t know about Discovery Home. Our cable provider makes it a part of a package that isn’t desirable. But the new system will make it more quality. The competition will be good. I can’t tell you all the details but I can give you lots of hope that things are changing in the South and it is bringing us out of the dark ages. There are so many that don’t know about you. They will in within about a year. You are so in the know compared to us. This is a sleepy little town. The problem with you not being known–the problem is that most of the cable in America is so old and the new cable is just now being put down to handle the hd capacity. One system isn’t going to rule anymore. You keep putting out your quality work and these new shows you are appearing on will move to the top quickly. You will rock! The old stuff will be left in the dust cause they didn’t care to keep up. thanks for letting me know I made the “final edit” on the HGTV show! I’m still in Florida, (finished my Epcot presentation today) and noticed late last night that HGTV ran the show and I didn’t know it was going to be on! I was hoping I would be included. You just gave me great news. I saw it will rerun on April 13. How have you been? Of course you “know me” that’s what blogging is all about! Friends. thanks for the nice words. I’ve been having a great time speaking at Epcot this weekend and the pillows have been a big hit! (of course I’m speaking on “Out of the Box’ design so it works! Looking forward to posting lots of photos and design ideas from my presentation when I get back to L.A.
Wow! That is cool…. I’ve seen a lot of garden art made out of a variety of items like old tricycles, bed frames, benches and other items, but that is cool. Please do share the Epcot experience when you get back. Very creative! I like the way the pink picks up the color in the succulents. I look forward to reading about your Epcot International Flower and Garden Festival presentation on â€œ10-Ways to Incorporate Art in Your Gardenâ€ .